Of course, this being the rather no-frills arena of device chargers, the Kensington AbsolutePower Laptop, Phone, Tablet Charger isn't really a head turner, but it is attractive and sleek. Most importantly, it sits unobtrusively on the desk and does a good job of charging three devices in one go. 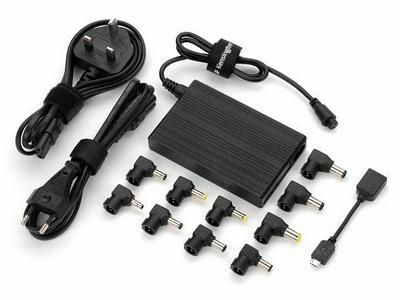 One of the devices has to be a laptop, and there our 10 adaptors included, covering the most popular laptop manufacturers. Kensington guarantees compatibility, and from the laptops we tested we didn't have any problems, although we can't vouch for more obscure or older makes and models. If you've got a few devices that charge via USB, as well as a laptop, then this is a handy and space-saving solution. However, if you don't have a laptop then one of the charging ports is useless, leaving you with just two. In this case we'd advise you to look elsewhere.